The department of You Couldn’t Make It Up has been working overtime in Indonesia lately. The president has nominated a corruption suspect to head the police, and is also busy blowing up boats based on some decidedly fishy statistics. On Thursday, parliament whisked through approval of a man credibly accused of entrenching systemic corruption to head the national police force. My favourite quote during the hearings comes from an approving lawmaker from the opposition Gerindra party, headed by failed presidential candidate Prabowo Subianto. “Your status as a suspect by the KPK is not out of the ordinary,” Great Indonesia Movement Party (Gerindra) politician Desmond Mahesa told Budi during the confirmation hearing. He cited several instances in which public officials continued to carry out their official duties despite being charged for graft. I don’t know that many honest cops in Indonesia, but all the ones I do know complain bitterly how hard it is to get promoted to decent posts without paying massive bribes. President Joko Widodo’s sole nominee for police chief, Budi Gunawan, was a particularly enthusiastic head of the police Career Development Bureau from 2004 to 2006, the period during which his bank account ballooned so much that it drew the attention of a force set up to combat money laundering. He has been consolidating his reputation since, and has been under formal investigation by the Corruption Eradication Commission, the KPK, for at least six months. He once served as adjutant to former president Megawati Sukarnoputri, Jokowi’s boss in the PDIP political party, though party spokespeople say that did not in any way influence Jokowi’s choice of Budi as the nation’s top cop. Not content with nominating potential convicts to head law enforcement, Jokowi has set himself on the pathway of enraging his neighbours. When the new president pulled a sudden vision of a Great Maritime Nation out of nowhere in his inauguration speech, I thought it might gently fade away as he tackled more important issues. But he seems determined to pursue his vision. Most particularly, he has decided that he is going to pull Indonesian fishermen out of poverty by blowing up foreign ships. He has repeatedly quoted “data” from the national audit authorities about the value of fish stolen from Indonesia waters: 300 trillion rupiah’s worth a year — around 25 billion dollars, he says. But can that really be? The Fisheries Ministry, which publishes very comprehensive statistics, put the value of the entire marine catch of fish and shell-fish in for 2013 Indonesia at 77 trillion rupiah, around US$ 7.5 billion at 2013 exchange rates, US$ 6.5 billion today. Export earnings are about half that. In other words, Jokowi believes that foreign fisherman are stealing over three times more fish than Indonesian fishermen are catching. Only one seventh of the “real” value of Indonesia’s fish exports is going to Indonesians. Is that really likely? I’d like to know a lot more about the source of those data: how do you even estimate the value of a stolen catch? And however large the theft, would sinking boats be the best way to increase welfare among the poorer of the 2.6 million Indonesians who go to sea in search of fish? The Indonesian fishermen I spoke to in Sangihe, up close to the Philippines, didn’t seem to think so. In fact, many of them confessed to “stealing” fish themselves, motoring 17 hours over open seas in small outriggers to sell tuna in the Philippines because there is less red tape and much better infrastructure. Imagine, they even have cold storage over in the Philippine port of General Santos, as well as cargo planes that fly direct to Tokyo, while if you ship through Indonesia, your fish will be sitting for a couple of days in a styrofoam chest surrounded by little plastic bag of ice made in the freezer compartments of locals’ fridges. Better infrastructure means fresher fish, and that translates into higher prices for fishermen. If Jokowi really wants to do something for fishermen, he should invest in infrastructure and in cutting through export restrictions and other red tape. 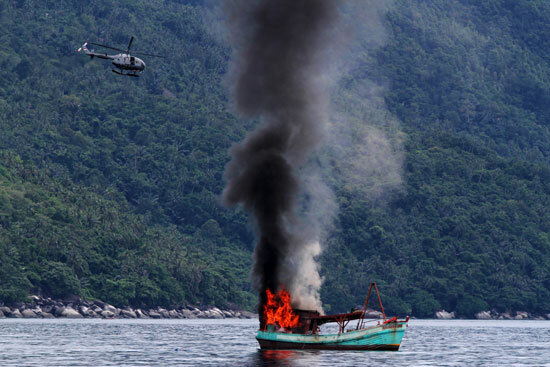 Sinking foreign ships makes for great photo ops, but apart from raising tensions in an already politically fragile seascape, it won’t do a thing for most Indonesian fishermen. Meet some of the fishermen of Sangihe here. This is one of the videos included in the enhanced eBook version of Indonesia Etc. 1 Comment on "From Indonesia’s Department of You Couldn’t Make It Up"
I think the practice of blowing up foreign boats comes from the Department of Sabre Rattling. As for the appointment of of Budi Gunawan, isn’t that from the department of Business as Usual?